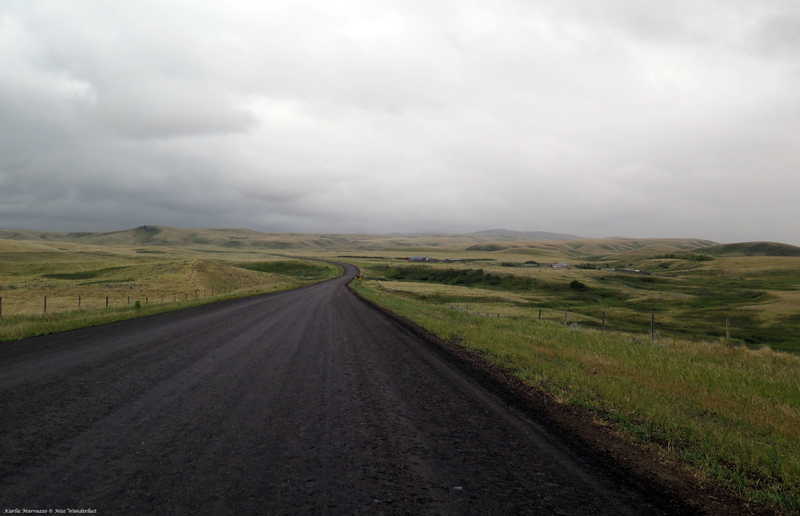 The road from Edmonton took us much the same way as the route to Dinosaur Provincial Park the previous year, traveling first on two secondary highways – east on 14 and south on 36. We temporarily deviated back onto the uninspiring Trans Canada Highway through Medicine Hat. Flat prairies stretch out further than the eyes can see on either side, punctuated by telephone poles and power lines. Things started to get interesting again on Eagle Butte Road. The blacktop began to curve in broad, gentle sweeps. 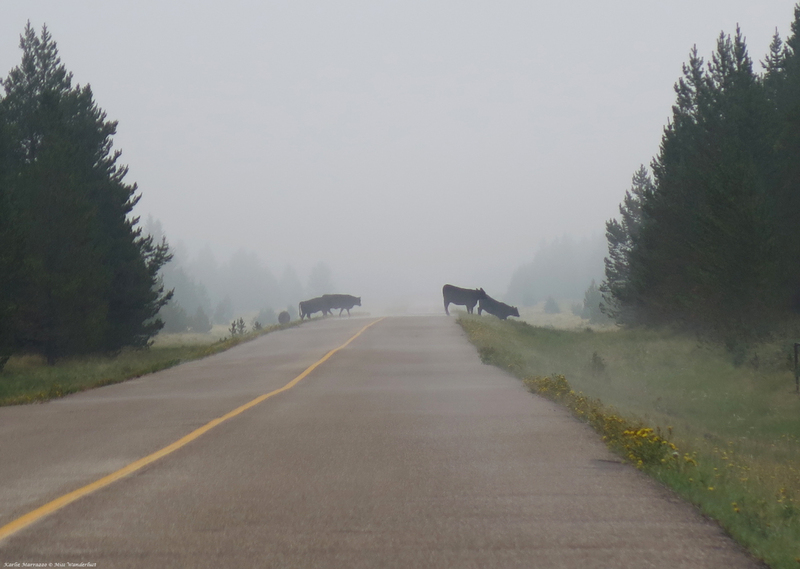 The fences that line the sides of the highway disappeared and cows roamed freely, grazing on the stubby, muted yellow and green grass. The grey sky, the feeling of being on another planet reminded me of driving through uninhabited parts of Iceland. I thought about how easy it is to get lost in the wonder of this world, and how you don’t have to go far to have an adventure. The thrill of being away from home began to course through my veins again. It had been drizzling and unseasonably cold all day, much like our wedding day eight years prior. We pulled into Elkwater, the only town in the park, in mid-afternoon. The weather hadn’t changed its mind yet, but it was still early enough that we wanted to try to enjoy some of the park that day. We started to drive down a narrow gravel road towards Head of the Mountain viewpoint. At 1468m (4567ft), it is the highest elevation in Canada between the Rocky Mountains and Labrador. 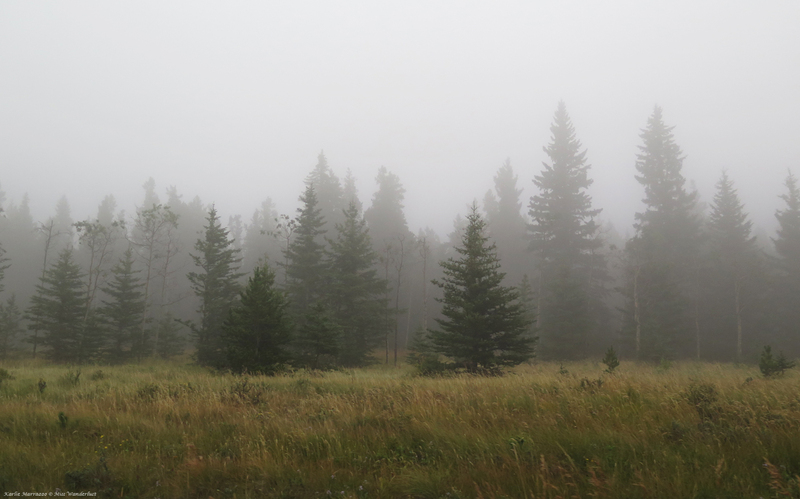 As the altitude climbed, the thin mist around us quickly grew into a solid wall of white fog. I couldn’t shake the eerie feeling seeping into my bones. Resigned to the fact that we wouldn’t be able to enjoy the park that day, we carried on to the east to our accommodations for the next two nights, a cute little cowboy on a real life working ranch, Reesor Ranch. 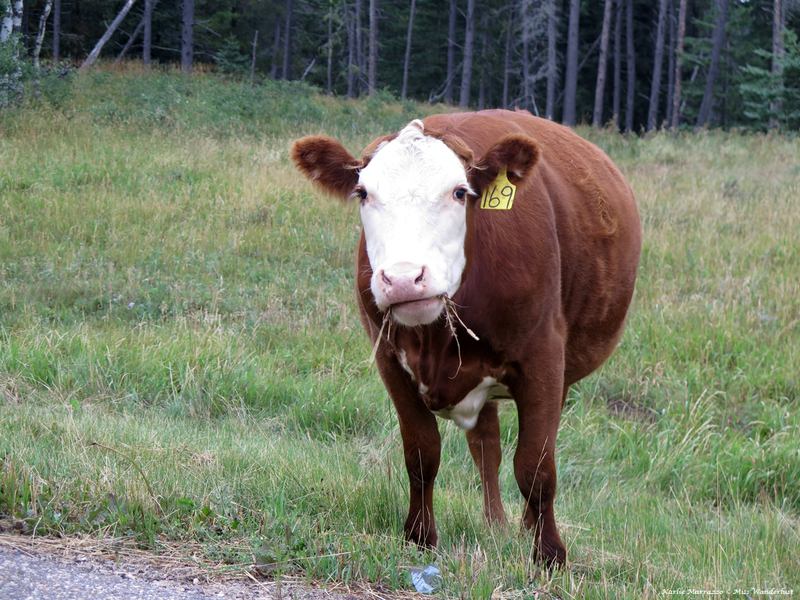 The ranch is immediately on the Saskatchewan side of the border, distinguished only by a post with an Alberta license plate nailed to one side and a Saskatchewan plate on the other. We settled into our cozy cabin and completely disconnected from the world. 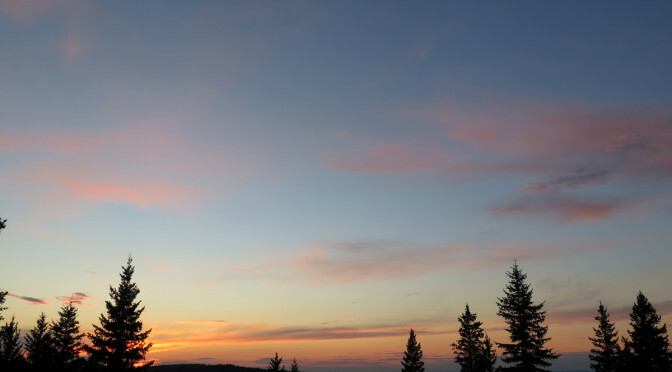 I often find myself struggling to truly relax and quiet my mind, but out there, in the middle of rural Canada, with no wifi or TV to distract me and with the temperature too cold to go outside, I was willingly forced into relaxation and quiet time. We cooked pizza on the barbecue, played cards and spent real quality time together. I find myself getting frustrated in a lot of social situations these days, with everyone constantly glued to the phone in their hands. 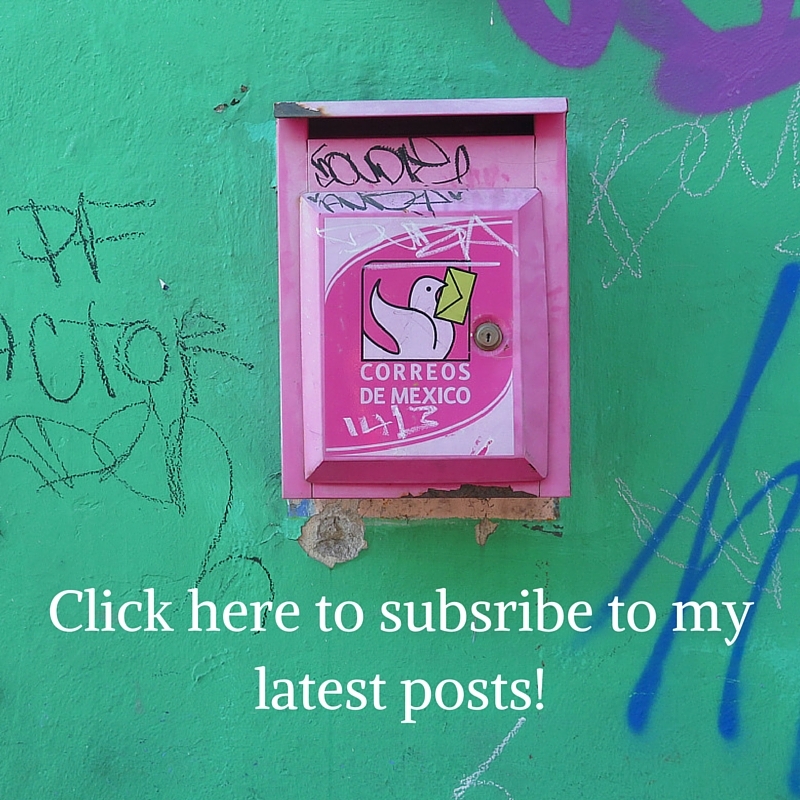 I’ve been working on cutting the cord myself, and taking trips like this really help to further push me in that direction. I lay in bed that night in complete darkness, no streetlights or electronics forcing their way into my surroundings. The pure silence outside made me feel uneasy as I tried to fall asleep; my imagination runs wild and I was dreaming up all sorts of imaginary monsters that were lurking outside. Sunday was overcast but the fog had lifted. 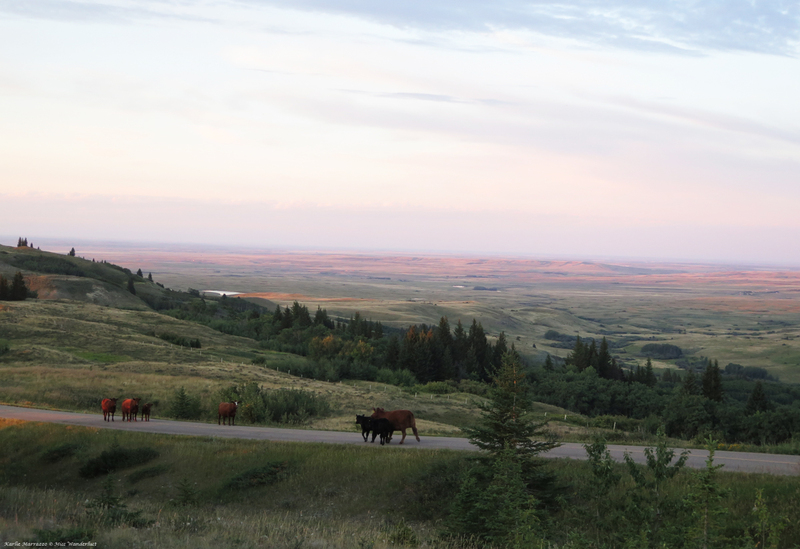 We started our day at the Reesor Viewpoint, a high point overlooking softly undulating hills and the flat prairies beyond. Silence was our soundtrack, punctuated only by the surprising mooing of groups of cows scattered all around us. I’m a city girl so I’m not familiar with the language of cows. Their calls were louder and more forceful than I expected, and sometimes even sounded aggressive. Long, drawn out bleats made me laugh. Our plan to visit a winery about an hours drive away was foiled when I realized that they weren’t open on Sundays. We played a round of free mini-golf in Elkwater before walking some of the trails in the area. Beaver Creek Loop is a short 1.3km hike that begins just off of the Beaver Creek campground. The terrain is fairly gentle and passes through spruce and poplar forest. A canopy of trees shades the first half of the trail, but as we continued to walk, meadow-like spaces opened up on either side. 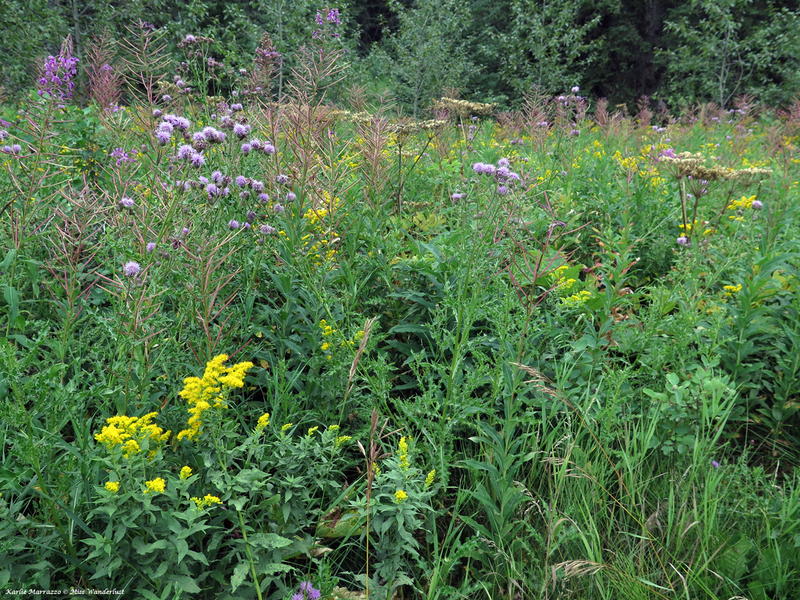 Purple and yellow flowers blossomed wildly amongst tall grasses. My hopes were high to see that famous Canadian mascot, the beaver, but luck wasn’t on my side, although we did see a couple of beaver dams in the pond. The trail was very pretty and reminded me of some of the North Saskatchewan River Valley trails at home in Edmonton. It wasn’t spectacular until I remembered that we weren’t in the forest, but in an island of lush nature in the middle of the flat, wheat covered prairies. Afterwards we took a casual stroll on the boardwalk alongside Elkwater Lake. The water was so still that it looked like a mirror, with cattails rising elegantly out of the lake. The skies finally started to turn to blue and the air to warm up. We climbed back into the car for another drive. Battle Creek Road is yet another gravel road (most of the roads in the park are) that passes through densely forested area into the Saskatchewan side of the park. There weren’t many places to pull over or much to see so we turned around shortly after entering our neighbouring province. That’s when we spotted a huge, green clearing with a tiny old cabin on the other side of a small stream. I had brought some pencil crayons and sketchbooks with me, which rarely happens, and found this the perfect opportunity. We settled in the grass on a gentle slope in the sunshine and sketched – the perfect way to relax. Sunset that evening was enjoyed from our favourite spot, the Reesor Viewpoint, again accompanied by all of our cow friends. 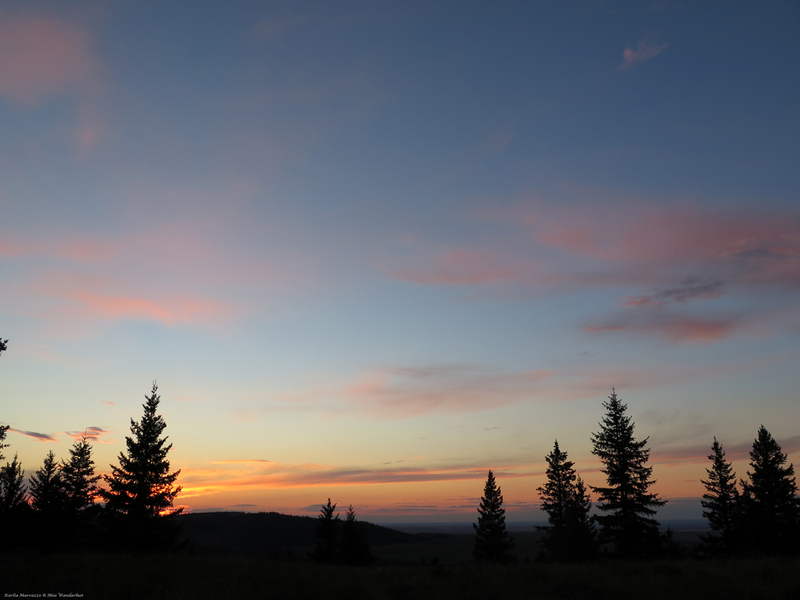 Cypress Hills is an officially designated Dark Sky Preserve, “a sanctuary from artificial light; the preserve is an area that maintains the nocturnal environment in as pristine a manner as possible.” There is more great information here. 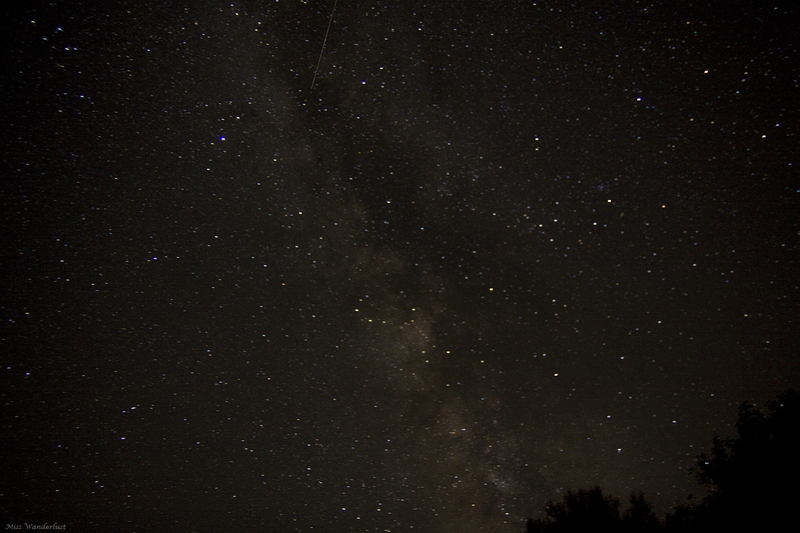 Back at the cabin, we wrapped up in blankets, stepped outside into the darkness and gazed upwards. It took a few moments for my eyes to adjust. I immediately saw hundreds of bright stars, followed by thousands more. There are so many stars I couldn’t tell if they were all real or if my eyes were playing tricks on me. They danced and blurred together. Galaxies were painted across the sky in broad strokes. A meteor streaked through the sky, right in front of my eyes. By lucky chance, we both saw it. It looked like it was shooting right at me, bright and hot and red. Objects around me became sharper and clearer as my eyes adjusted further. 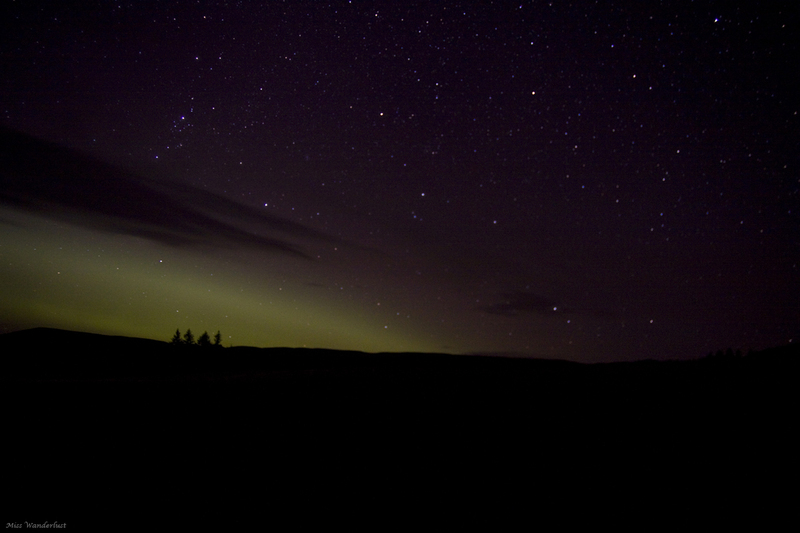 In the distance, the Northern Lights danced. Always trying to see something different, we left the park a different way than we came in, this time taking Graburn Road. It was more isolated than any other road we had been on that weekend, and most other roads we have been on, ever. With the wide open dome of Alberta sky above me and the rugged terrain blending together with the rocky road underneath my feet, I felt like the world was mine to discover. 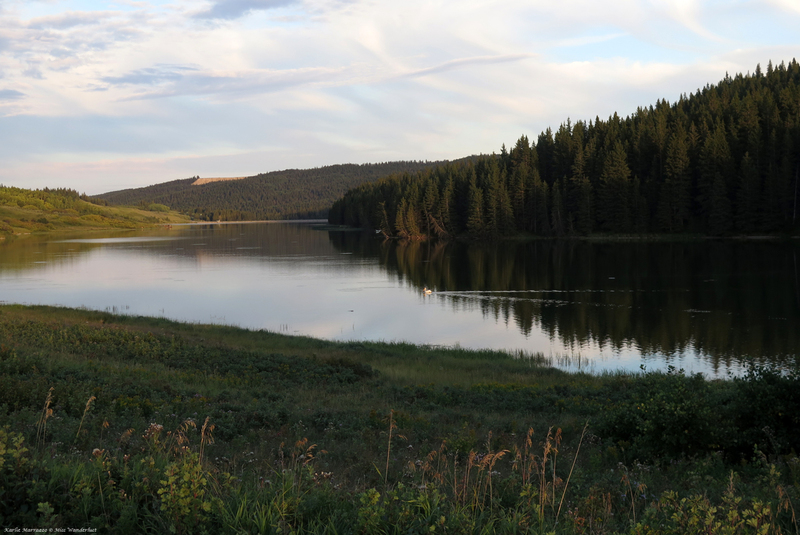 Camping in Cypress Hills? Check out Mostly Oragnized’s camping checklist! So glad you enjoyed your visit to our beautiful part of the world. 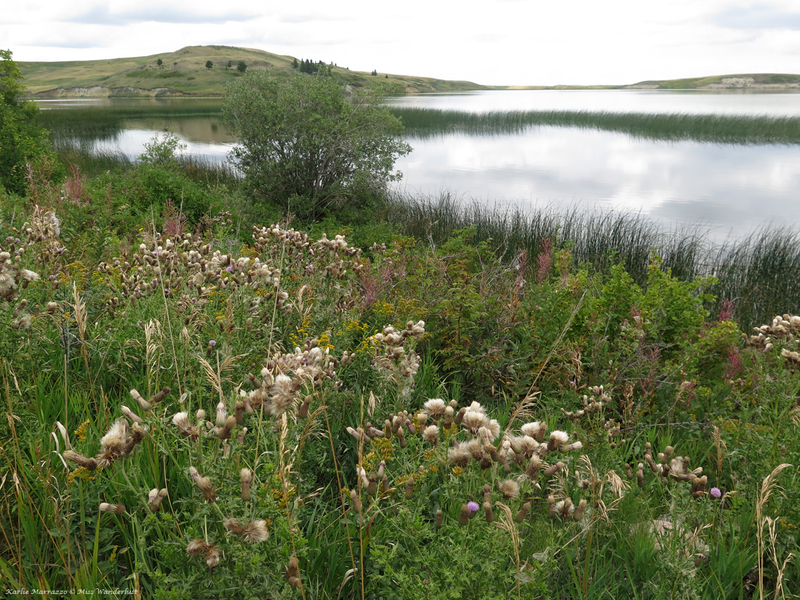 It is hard to encapsulate the stillness, and it’s remoteness, despite being less than four hours away from Calgary, an hour from Medicine Hat, an hour an a half from Swift Current, and three and a half from Regina – but you did an excellent job. My kind of place. Very well written. It sounds like you enjoyed a few very peaceful days. A break from all the devises around us to enjoy life’s beauty. Your pictures are fabulous & I always enjoy your writing, this one especially. Beautiful pictures and wonderful writing!